See the new trailer from the heroic action-thriller The Finest Hours which has just arrived from Disney. This exciting drama tells the remarkable true story of the most daring rescue mission in the history of the U.S. Coast Guard. Presented in Digital 3D, Real D 3D and IMAX 3D, the film transports audiences to the heart of the action, creating a fully-immersive cinematic experience on an epic scale. Sure to leave you on the edge of your seat, The Finest Hours is the remarkable true story of the greatest small boat rescue in Coast Guard history. On February 18, 1952, a massive nor'easter struck New England. The storm pummeled towns along the Eastern seaboard and wreaked havoc on the ships caught in its deadly path. This included the SS Pendleton, a T-2 oil tanker bound for Boston, which was literally ripped in half, trapping more than 30 sailors inside its rapidly-sinking stern. 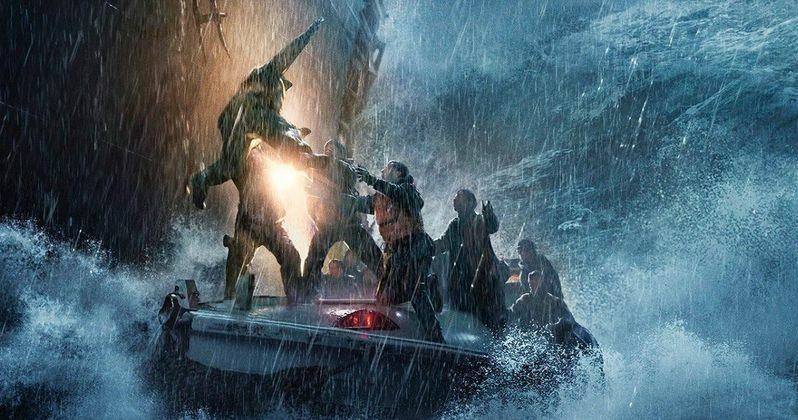 As the senior officer on board, first assistant engineer Ray Sybert (Casey Affleck) soon realizes it was up to him to take charge of the frightened crew and inspire the men to set aside their differences and work together to ride out one of the worst storms to ever hit the East Coast. Meanwhile, as word of the disaster reached the U.S. Coast Guard station in Chatham, Massachusetts, Warrant Officer Daniel Cluff (Eric Bana) orders a daring operation to rescue the stranded men. Despite overwhelming odds, four men, led by Coast Guard Captain Bernie Webber (Chris Pine), set out in a wooden lifeboat with an ill-equipped engine and little, if any, means of navigation, facing frigid temperatures, 60-foot high waves and hurricane-force winds. Disney's The Finest Hours is the unforgettable story of the Coast Guard's courageous mission. The movie is directed by Craig Gillespie, best known for such films as Million Dollar Arm, the Fright Night remake and Lars and the Real Girl. The Finest Hours stars Chris Pine; Academy Award and Golden Globe nominee Casey Affleck; Ben Foster; Holliday Grainger; John Ortiz; and Eric Bana. Produced by Jim Whitaker and Dorothy Aufiero, the screenplay is by Oscar nominee Scott Silver and Oscar nominees Paul Tamasy & Eric Johnson based on the acclaimed non-fiction book of the same name by Michael J. Tougias and Casey Sherman. Doug Merrifield serves as executive producer. Prepare for one of the worst storms in the history of the U.S. Coast Guard. There won't be a more thrilling true-life tale this winter. The Finest Hours storms into U.S. theaters on January 29, 2016 in Digital 3D™ and IMAX® 3D. It will be going up against the spoof Fifty Shades of Black starring Marlon Wayans, Mike Epps and Jane Seymour, and the anticipated family movie Kung Fu Panda 3. Which one will you see? Take a look at this latest footage, and maybe it will make up your mind! We also have the new poster that debuted earlier this week.